The Holy Martyress Liudmila, a Czech (Bohemian) princess, was married to the Czech prince Borivoy. Both spouses received holy Baptism from Saint Methodios, Archbishop of Moravia and Enlightener of the Slavs (Comm. 11 May). As Christians, they showed concerned for the enlightening of their subjects with the light of the true faith, they built churches and invited priests therein to make Divine-services. Prince Borivoy died early at age 36. 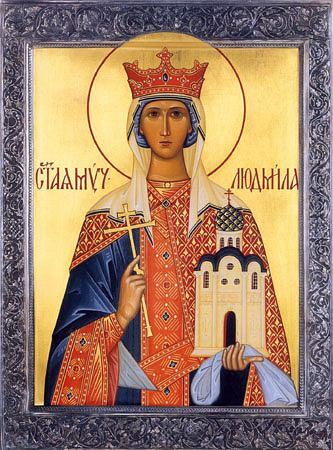 Saint Liudmila as a widow led an austere pious life and continued to be concerned for the Church during the reign of her son Bratislav, which lasted for 33 years. Bratislav was married to Dragomira, from whom he had a son Vyacheslav. After the death of Bratislav, 18 year old Vyacheslav came on the throne. Taking advantage of the inexperience and youth of her son, Dragomira began to propagate pagan manners and customs in the country. Saint Liudmila of course opposed this. Dragomira came to hate her mother-in-law and tried to destroy her. When Saint Liudmila moved away to the city of Techin, Dragomira sent there two boyars in secret to murder her. At the time Saint Liudmila was praying, and the two assassins entered the house, carrying out Dragomira's orders. The relics of the holy Martyress Liudmila was buried in Techin in the city wall. From her grave there occurred numerous healings. Prince Vyacheslav transferred the body of Saint Liudmila to the city of Prague and placed it in the church of Saint George.